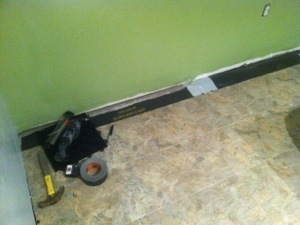 I’m installing my new interlocking tiles for my basement floors from Modutile and its going very well. It is much easier than I imagined it would be. Cutting the pieces for the edges takes a little effort but not much. I’m using an oscillating saw which is probably not the most efficient way to cut them but its all I got. I will post more pics when I’m done. It looks good so far. We would love to see the final pictures. 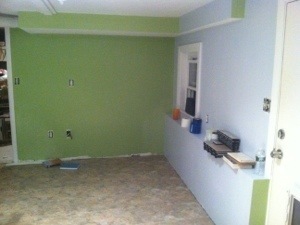 We’re considering using Modutile in our basement and found your pictures during our research. We’re wondering what your opinion is of the product now that you’ve had it for a while. Thanks in advance for your response. I love the floors. There are a few things I wish I had known before hand. I don’t think they would have changed my purchase but it would have been nice to know. It’s hard to really understand the product from the site. Do yourself a favor and buy some samples. Play with them, step on them, etc. 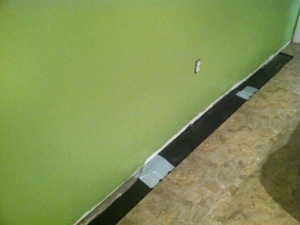 The stone looking tiles have a linoleum tile glued to the top of a flat surface modutile. The tiles are tough (I have 4 kids and a dog) but they are susceptible to gouging. Do not clean them with anything caustic because the plastic covering will peal and the color will fade. The gray plastic only tiles are the best looking in my opinion. The brown is a little cheesy. The tan is nice too. Overall, I am very happy with my purchase.